When I first heard the synopsis to this one, I really wanted to read it. Delilah sounded like one I can relate to. She sounded just like me in so many different ways. And when I started the book, I was like 'Yeah. She sounds just like me! Yay, bookworms!' But somewhere down the line, I kind of got annoyed with her. Just a little smidgen. Not enough to make me toss the book, but enough to make me put it down every now and again. Ahh, we just didn't connect. The idea for the book was something so original that I couldn't help but enjoy it. It really made me think. What if our books were alive inside the pages once we closed them? What are they saying? What are they doing? Does it only happen in picture books? COULD I FALL IN LOVE WITH WILL HERONDALE?!?!? * Yeah. Questions like that. Overall, I thought the book was really cute. If you know me, I'm not into books that don't have a lot of action and death and adventure in them. Sure, I'll read an occasional contemporary because I'm a girl after all and I sometimes need to feel all heart-smooshy. But if you didn't know this about me, now you do. The best part about this book? The illustrations! I can't even remember the last time I read a book with pictures in them. Second grade, maybe? Anyway, it's been a while. And they weren't like these little teeny pictures that were put in the corners of the pages (although there were plenty of them). No. The ones I'm thinking of were beastly giants that took up entire pages and they were magnificent. So beautiful. I'd stay on those pages just to study each and every small detail in each of them. They were so beautiful. Another thing that was pretty cool? There were three different point of views! There was Delilah and there was also Oliver (our Prince!). But the coolest thing was how, every few chapters, there would be a different story altogether. It was the real, original fairytale from the book that Delilah picks up and from where Oliver is from. I thought it was such an interesting idea, and I really was interested in what would happen to Oliver in the end (story Oliver, not love-sick-over-Delilah Oliver). Between the Lines was a sweet tale where all the characters we love in our minds and hearts are alive--literally. It was enjoyable and we follow Oliver and Delilah through their quest to get Oliver out, and each time, readers get to watch their sweet romance grow. 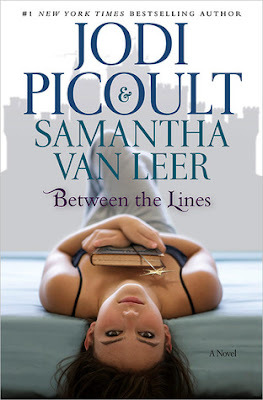 If you're into the impossible love story, Between the Lines has it!